I found out during my past couple of teaching gigs that many fiber folk don’t know that I have a newsletter. I do! I have a newsletter that comes out once a month full of fiber and other things I find interesting. 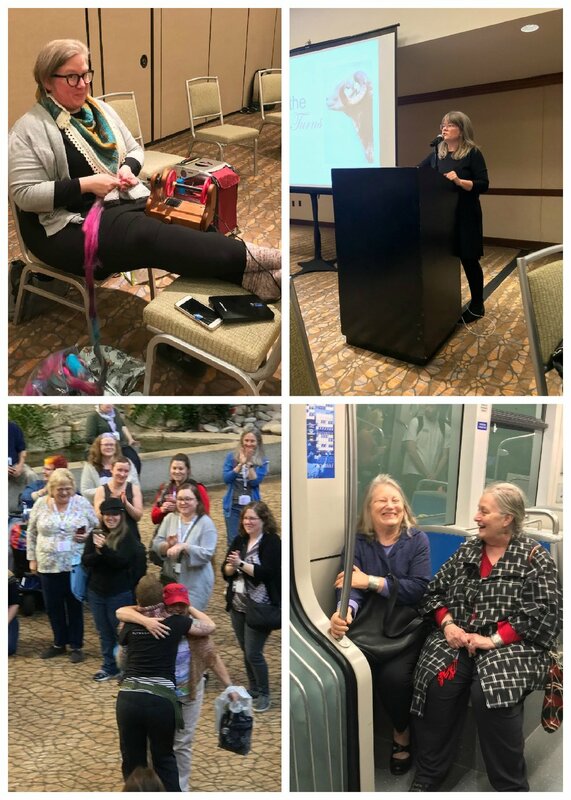 There is always something about spinning, usually something about knitting, my upcoming teaching schedule, a few links to articles I liked that may or may not be textile related, and a list of what I read and watched over the past month. Interested or curious? It’s easy to sign up, and rest assured that I will never sell or share your information with anyone. I’m headed to Maryland Sheep & Wool to teach next week. If you see me looking like a deer in the headlights on Saturday at the festival, just tell me what to buy and where to find it. I’m a first-timer! This will be a photo heavy post because I know you like to look at all of the pictures. PLY Away was wonderful as always, so many familiar faces, and so many people to hug. We love not having to explain or backtrack in our conversations. If someone whips out some fresh fleece and starts talking crossbreeds and microns, everyone understands. Heaven. I had new excited students, and was so happy to see a whole bunch of students I’ve had before. They are starting to feel like family. I premiered three new classes, and had a new focus for my Spin and Nosh class. Spin and Nosh was raucous, there was a lot of wine and Jill of Hipstrings, whose fiber was featured in class, brought the shopping to us after the market closed. It was the best kind of chaos. I was lucky to get a spot in Judith’s spinning paper class. It was such a restful half of a day in the middle of teaching. Clara Parkes, wool warrior, was our Friday night speaker. Sheep really don’t know how good they have it with an advocate like Clara. She is smart, funny, and tough. She wants to change the way the world sees and uses wool, and we are right there with her. Of course there was shopping. I had a modest haul this year. Fiber-wise, I bought raw fleece (don’t faint) from Ross Farms for an upcoming article, Abstract Fiber Arts new AOC colorway on three different fiber blends, and her Deschutes colorway on BFL/silk. I mostly bought tools, the Hansen Lazy Kate and ball holder (it’s spins so smoothly! ), Hipstrings genius new Z Loom with interchangeable dents, and Clemes and Clemes cotton handcards, which are now my favorite cards. I’ll talk more about all of my purchases as I use them in the coming weeks. The Pen Place at the hotel loves PLY Away. Who knew so many spinners love fountain pens? We did, it’s a tactile thing. I have a special stash of money I save for pen shopping every year, and I stalk pens until I can shop at PLY Away. Discussing pens is always an important part of every class and every lunch. I like to shop with friends, and we usually come away with matching pens. This year I bought the new olive Lamy Studio, a Kaweco Frosted Sport in blueberry, and a Caran d’Ache 849 in neon pink. I know Maggie Casey, Judith MacKenzie and Clara Parkes bought at least one pen and maybe more……. This is Merino/silk top from DM Fibers. It’s labeled top on their website. Isn’t it pretty? I have noticed a trend online lately to call both woolen and worsted spinning preparations, roving. Even if I can see quite clearly in the online photo that a fiber is top, it still is labeled roving. The ever-wise Liz Gipson told me, roving is becoming like Kleenex is to tissues, a generic term for commercially prepped fiber. I had a student in my class just yesterday suggest that roving is a term better used in searches online. A search for top would return millions of things, mostly not fiber. So, if you are buying fiber online, and are not sure what the prepartion really is, email the seller and they will surely let you know. 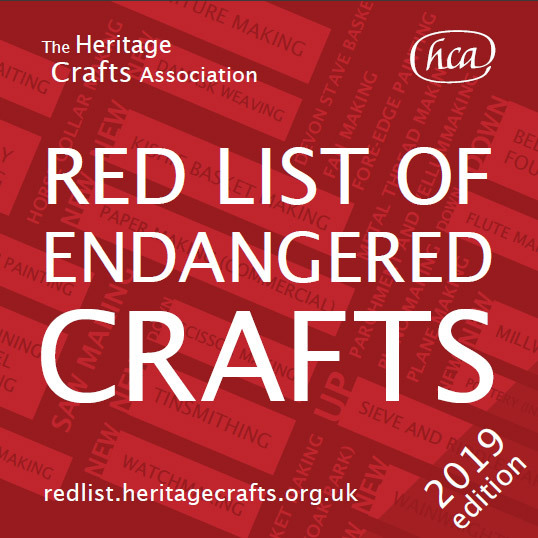 Did you know that the Hertitage Crafts Association in the UK publishes an endangered crafts list every year? The mission of the HCA is simply and wonderfully, "To support and promote heritage crafts as a fundamental part of our living heritage." The HCA published it's first Red List of Endangered Crafts in 2017. Similar to the Rare Breeds Survival Trust Watchlist, the HCA uses four catagories to rate the threat to a hertitage craft, extinct, critically endangerd, endangered and viable. One of the new entries for 2019 on the critically endngered list is spinning wheel making. These are small batch makers, making wheels one at a time. In the UK like the US, there are not many people who want to apprentice to wheel makers. Remember this Nest BFL fiber I spun and knit a tiny sample out of becasue I thought I might want to weave it? Well I bought a weft yarn, naturally dyed, laceweight, merino/silk from Sincere Sheep. 1,200 yards will get me a lot of weaving. 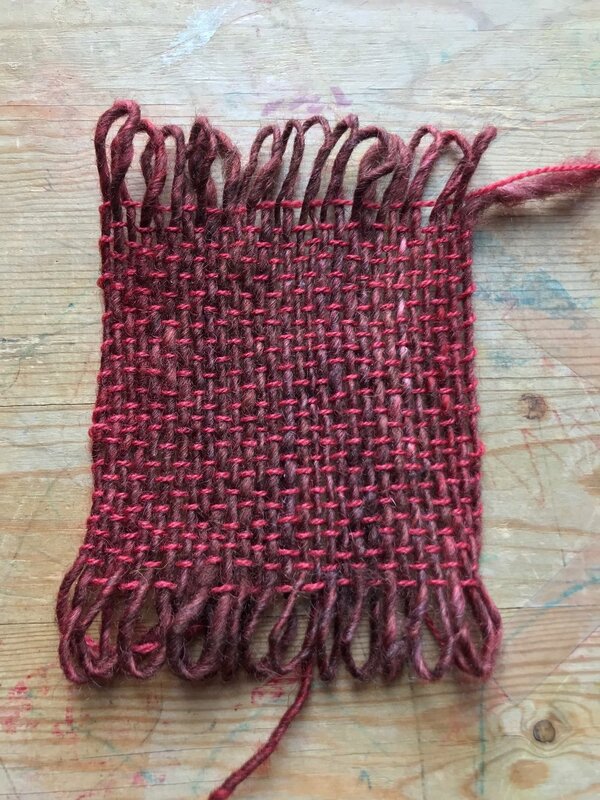 Before I just jump on my loom I wanted to make sure that the red of Sincere Sheep will go with the red in the Nest BFL, so I wove a tiny swatch. The sett is 8 epi on a Purl and Loop Wee Weaver. I wove it at about the same picks per inch. The swatch is tiny but I can see the reds play very well together. When I weave it on my Cricket I'll keep it at 8 epi, and maybe weave it less than a balanced weave, a little more open. The rest of my yarn is outside drying. It's above freezing! In Michigan! Then it's math time before the warping and spinning. It's going to be a scarf with some twisted fringe. Right now, I'm happy with the idea of just weaving scarves. I had a student recently ask me, "Do you ever use natural colors?" And she didn't mean naturally dyed colors. I do use naturals and there are some I'm quite fond of, humbug BFL and oatmeal BFL, have always excited me. Greys and browns make me quite swoony. I've been spinning a bit of commercial Shetland from Dashing Mouse, and I recently ordered some moorit Shetland - the lighter redish-brown in the photo. It’s gorgeous by itself, but I got the idea of blending the moorit with the other colors. 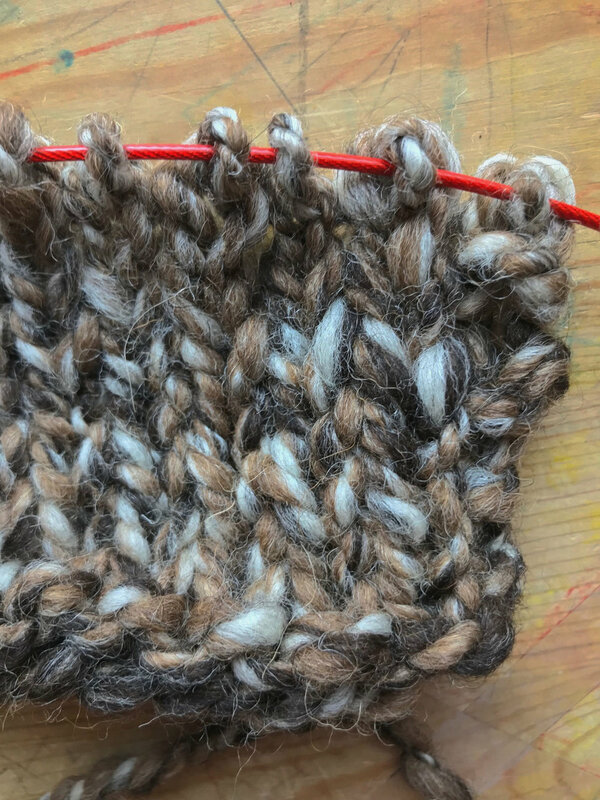 I drafted it with white, grey and dark brown Shetland (bottom to top) into chunky 2-ply. The moorit makes an nice accompaniment to all three of the naturals but the dark brown and moorit is my favorite today. The white is too much contrast for me and I wish the grey were darker, more like oatmeal BFL. 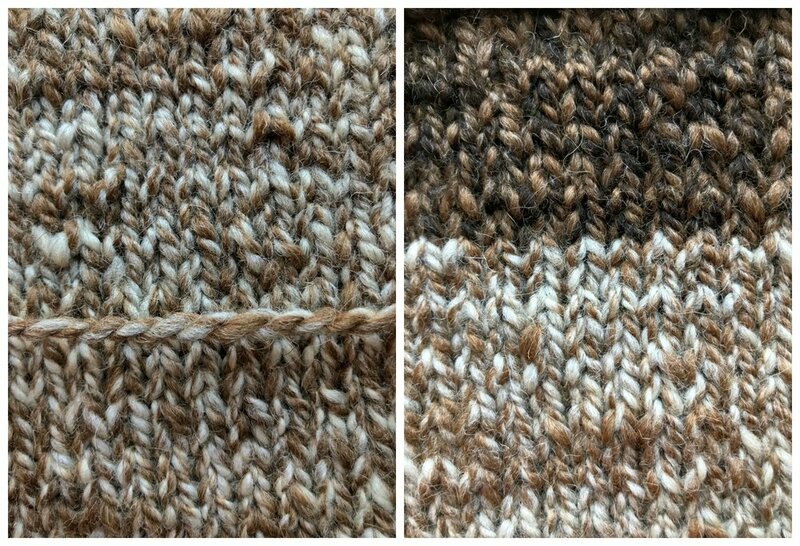 Here’s a close up of the white and grey (left) and the grey and dark brown (right) all drafted with the moorit. What I really like about all of these, and why I like drafting fiber together rather than carding or combing into a new color is the randomness of the color placement. I like the visual motion that the random placement gives the knitted fabric. It’s like the colors are skittering across the swatch. I do want to spin some of each of these thinner to get the colors to blend more and then knit and weave them. I’m dying to know if the colors skitter in woven cloth too. As a last fun thing, I drafted the moorit, grey and dark brown together. It was just a whim, but I think I like it the best of all. 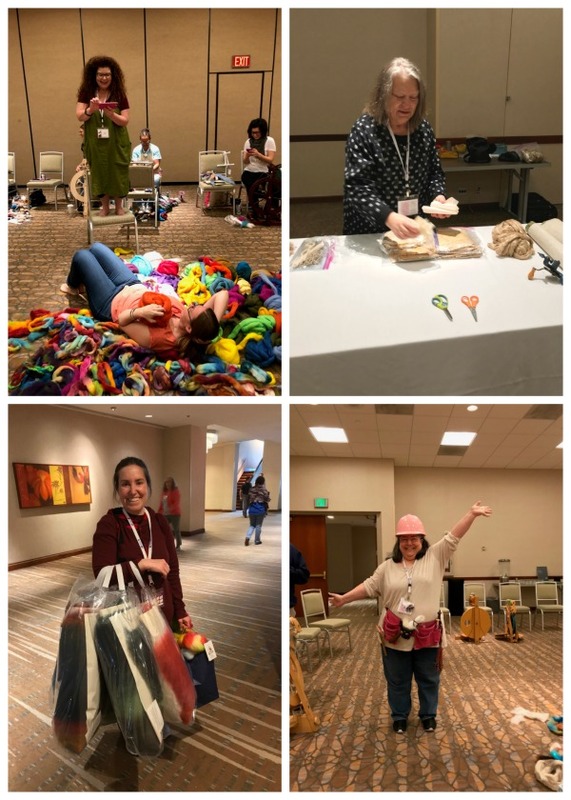 Fabulous teaching photos by Ann Krieg! 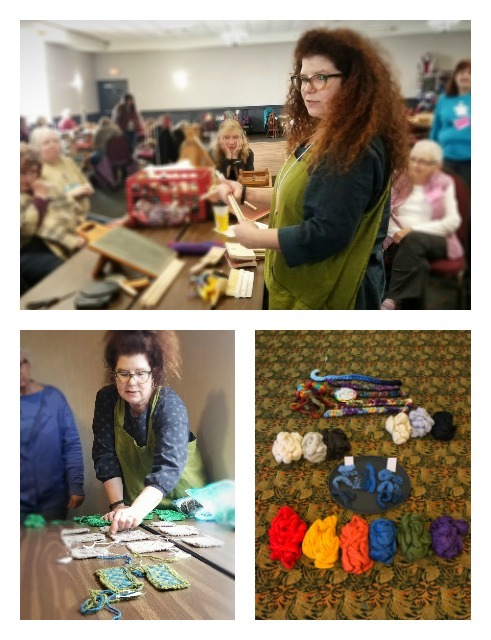 I taught at Susan’s Fiber Shop retreat this past weekend. We cozied up in a hotel while the temps outside dipped below zero. A whole bunch of spinners filled a ballroom and some of them gathered round while a did a blending board demo. A few more took classes with me for the next two days. We had a great time, they were skilled spinners with a lot of questions. We covered our class material and a lot more. There was a field trip one afternoon to Susan’s Fiber Shop. Holy cow! 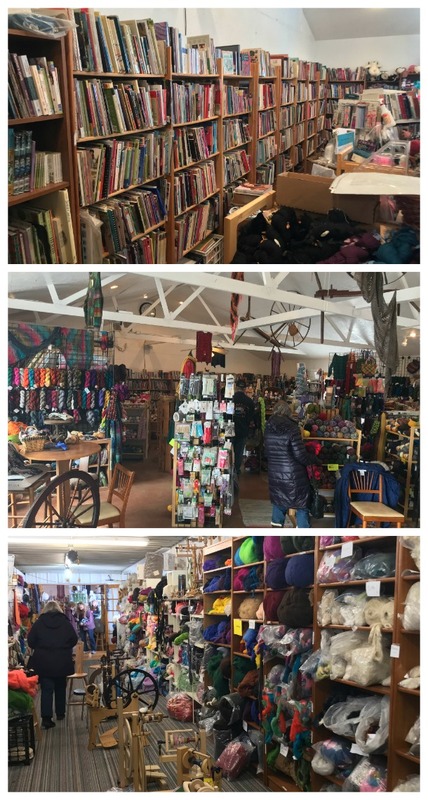 It’s giant and there is everything a fiber fanatic would want, knitting yarn, spinning fiber, beads, weaving yarn, and so many books. The book section is biggest I’ve seen in a shop. She has new books and a lot of out of print books. It was a great way to spend the afternoon! The spinners of Wisconsin whisked me away to the Nordske Nook where I had a slice of lingonberry sour cream. It was divine.